You can read in my post which catalogues Dan's Vaults about some of the things that have happened to me in the 70s and 80s while following Jesus. 12Therefore Jesus also, (W)that He might sanctify the people (X)through His own blood, suffered (Y)outside the gate. 13So, let us go out to Him outside the camp, (Z)bearing His reproach. 14For here (AA)we do not have a lasting city, but we are seeking (AB)the city which is to come. I believe in the States you have the traditional churches and the Emerging churches. Is that correct? In England we have the emerging churches emerging from the Emerging churches which 30 years ago emerged from the traditional churches. Perhaps this is now the same in the States. You see we have to keep emerging!!! But instead of creating new churches...here's a radical concept....why not have a structure that keeps re-positioning itself?.... That is constantly in the Spirit at least...going outside the camp....being the intercession for new believers, for new breakthroughs as we see God's Kingdom coming to earth. In Acts, after the initial breakthrough and wave of persecution, they re-positioned themselves afresh.....bracing themselves for fresh breakthroughs but also fresh persecution, and the Lord confirmed their boldness by shaking the place they were in and sending fresh anointing. Some people have been sharing the reception they get after leaving a church. Some have been thrown out. Some felt to leave. But however they left they have been experiencing "those knowing eyes" from brothers and sisters who judge. That was what I experienced in the late 80s. If they were looking at me. Many did not look. Many crossed the road.......But the most healing thing for me was to get on with what was laid on my heart to do. As I said to Dan, it was the time of Michael W Smith: Eye 2 Eye, Amy Grant: Lead Me On, and Whiteheart:Freedom. Talk about strength in a desert. Apart from the Bible, what was there at this time? This music was real food. I had no one, but a gentle couple round the corner. I had left my hometown, my university...to position myself to learn more. For 10 years(1978-88), I had thrown my lot into a Christian charismatic community, where I had learned tons, including accompanying someone in New Testament style to help build a church from nearly scratch in France near Paris. So, as many of you ex SGM-ers or whatever are experiencing.....you leave at your peril. All your existential roots are with a group you thought you'd be with or moving out in the gospel with forever! And there it is. All gone! The only material root I still had, of any importance, was my job. Piano tuning. Oh and a mortgage on a house. But I was finding out how to articulate what God was doing in me. No one would listen and you can see even today it is tough. How do you think George Warnock got on when he discovered it all in the early 1950s!!! I bet he had tons of set tos with Ern Baxter, when he was his personal secretary. Some day I'll explain more about what I did during this time :the music double CD on the 3 levels, and the making of the 1989 3rd level Christianity message tape, then the writing of the "Letter to the Charismatic Movement" and how I hired a fantastic huge self-catering house to share my findings with my University friends....one of which is now my wife......so all was not lost! This was me putting my flag in the ground at this time in raw faith. Apart from a softening on the part of two other close friends....that has been it for 20 whole years. It's just been me...living it. Slipping. Falling. Carrying on. Each time with slightly more confidence. Then getting married at the ripe age of 40...and having to learn it all again in the context of family life....oh and with stepdaughters suitably embittered by their mother not putting up with the stuff her first husband wanted to do. Normally at this stage a marriage counsellor chips in with "there are two sides"...but are there always? Sometimes there is a stand to be made and it is a tough call. I was a distant friend, right out of the picture. And slowly the Holy Spirit graciously began re-building her amongst covenant relationship type life-joints that were in her region. We don't talk like this anymore...people are so hurt by a Covenant Church vision that splintered on the rocks of time. But, I tell you friends, Covenant is coming back! In the 3rd level there is a foundation!!! His Name is the Lover of our souls...Jesus. More in a later post. 2nd level intercession is about corporately praying together as led by the Spirit...whether in prayer, praise, faith proclamations, use of tongues in warfare....maybe even prayer walks. 3rd level intercession involves you. The whole of you. No holds barred. There is no escape. Forerunners include ofcourse Paul, who every time he was thrown into prison...another gazillion were born again...somewhere. Or in recent history Lydia Prince, explicitly obeying the Spirit to move to Jerusalem and being open to raising orphans. Or Watchman Nee willingly, but as commanded by the Spirit...re-entering a Chinese prison of his own accord in 1966.And dying there. And so on and so on. I love Matt Redman's songs, by the way. I love my songs too! But just singing was not what St Paul was asking. So by around 1990 I had begun an intercessory path. But while the big project of the last 20 years has been going on, I became aware that I was on a little 4 year one from 1990 - 4. Christian Media - Whether the paucity in the Uk of Christian media and music was impressed upon me so heavily, because all my friends had scarpered...and there was little in the way of input? Most was coming from the American Contemporary Christian Music scene as I have already mentioned. Then we learned that United Christian Broadcasters Northern Ireland had been given a MW radio frequency from an old, now defunct Moscow propaganda radio station and was blanketing the UK with the gospel, and Christian programming. You should know that the UK had developed strong misgivings over Christian TV and radio media as practiced by Americans. This had been in no way helped through the various scandals that had just come to light concerning 2 American evangelists. So, in their wisdom, the UK Government banned UK wide Christian programming, whether by radio or TV. They would argue that various ITV and BBC religious programmes would supply those interested in these type of things. There is a fundamental difference however between the histories of the USA and England to this point. England effectively pushed out of this land adherents to a Christian faith that included an internal confirmation of second birth...or being born again. For the sake of acquiring freedom to take the Bible at its Word, huge numbers left our land in the early years of pioneering the new nation across the pond. Various freedoms are enshrined in USA Law that are not included in our laws. Nevertheless we enjoy great freedom here until the State get involved with religious matters. The Anglican Church with both its good and bad points, are effectively de facto the foundation of religious life here. Unlike the Catholic influence in history in European nations, we have enjoyed the reading of the whole Bible in our own tongue . This has only recently been the case in the Catholic Church since the ruling of Vatican II in the 60s. But many of the encrustations of centuries of what is actually Biblical rebellion have passed into the Anglican Church. Religious heirarchies are not Biblical. Geographical heirarchies are not Biblical. One man ministry is not Biblical . Infant baptism is not Biblical. A church that neither recognises rebirth, nor Baptism of the Spirit with miraculous giftings as the normative behaviour of a Christian is not Biblical.Ministries that do not emerge over time by recognising the Holy Spirit anointing on a believer...are not Biblical.....indeed so much is sick about the Anglican Church from its internal structure, to its non-Biblical systems of running services...is it any wonder that God has begun the other way round with churches such as Chorleywood and Holy Trinity Brompton, by first giving the members a proper Christian experience, then working out from this point to discovering how to run church life? Yet, up to this week at least they still remain successful Anglican Churches. Back to media. UCB,the broadcasters mentioned above, soon had their mediumwave frequency, which had been given them by the Russians, taken by the UK Government. This was then sold on to the highest bidder. This raises questions like...when somebody overseas gives you their frequency...does any Government own the right to that frequency...by virtue of the frequency being broadcast across their airspace. Under that rule...how does the BBC get away with broadcasting the World Service across closed nations? Is this a case where the UK is acting like the USA does in claiming the higher ground. On whose authority? It is certainly not the unanimous verdict from all the other nations..... This is where questions regarding democracy come into play. Does anybody out there understand radio licensing law? So having UCB removed as a Life source was a big thing for me...and I felt it very keenly. This moved from being a niggle to a Spirit burden regarding the Christian message in Britain. I used to belabour my tuning clients, Christian and non-Christian. Sometimes it slipped into a petty anger, but overall I felt the full force of what was going on....or rather what wasn't going on in Britain. In the USA there was a whole raft of Christian media. A full selection of Christian contemporary musicians. What was it like in England? Well the musician who worked with me on my double CD was one of only a handful of full-time Christian musicians...and after producing with me, tried his hand in America, helped by the fact that his wife was American. UCB sent out regular newsletters detailing their efforts with media lawyers. On a couple of occasions I organised fasting and prayer weekends with the handful that were talking to me, in Bucks and Hants. We prayed. We read the newsletter. The news got worse. We prayed. It was like a lead weight in my stomach. Romans 8:26"groaning too deep for words".On and off this continued for around 4 years. The first major breakthrough was the setting up of PremierChristian Radio around London. There was a legal doorway left open in the 1990s UK media laws. Nationwide coverage was prohibited, but certain cities could apply for local licences. The most 3rd level material on Premier comes through Colin Urquart, and also recorded messages of Witness Lee (a Watchman Nee contemporary). Can you imagine the frustration of living in a country where the most 3rd level stuff you will ever here in Britain cuts out at Guildford, halfway to the south coast? In case I forget later I want to highlight the main point in this post: there are 2 levels at which intercession occurs. Here I am using "levels" in simple English usage. The surface level means we see a problem and we do whatever lies to hand to address this problem. This is according to our means, where we live and our general level of vision. I am a Brit, and we suffer with a little and insular vision. Thankfully, I as most reading this blog are Christians or maybe about to be Christians. And Christians have the Spirit of Christ on their insides...which gets fully released in the Baptism of the Holy Spirit. And the Spirit of Christ thinks and groans through us on a very much larger scale...Global scale...Kingdom scale. nor is it for me to be self-effacingly nauseating and say "Oh it's nothing really!" no...it is to say, this is how the Kingdom works...like it or lump it...and the same Jesus that is in me or Rob Rufus or Mark Stibbe, or a born-again 5 year-old...is the same Jesus in you. So at the surface level...we do what is in our hands to do. But in our spirit the Almighty power of God that knows no limits is labouring to achieve "the greater than we can ask or think". So, at the surface level, the great Chris Welch with the British vision of a gnat says...there's no Christian TV, no Christian radio...I know, I'll create a video library of teaching . People will join for the fee of one video (VHS days) then pay a modicum £1 or so for each borrowed tape to maintain and extend the library. Because Morris Cerullo's events contain at any time 15 or so of the top current anointed teachers, I bought whole sets of his events. I bought Roberts Liardon's great Generals series. And so on. I think about 5 people ever joined. But I enjoyed the messages anyway. This is what God did. perhaps they still don't. I know what I believe. I have, in 26 years, only advertised pianos in a national paper about twice. This was before Google and web business! A young couple in Bromley saw my ad for a grand, visited my house and arranged to buy it 3 months later in September. This was going to be after one final concert tour in South Africa playing keyboard with Blondie. This would provide the money. September came. The piano stood there. They had lost my details. They never bought the piano.The whole thing was a non-event. I know all the details...because I met them again...at a Kenneth Copeland Believer'sConference in Bournemouth. On the stage. In my house, we'd ascertained we were all Christians. 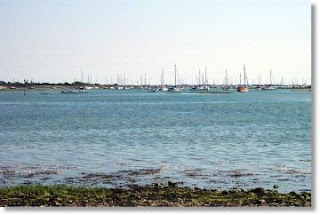 We spent an hour together sharing stuff...walking down to Emsworth beach(See picture above). I played them the Joel 2 track on my CD. The lady said"Sounds just like Dad's prophecies". I explained a bit about what I was doing and my discoveries to do with the 3rd Level. They, like most, thought it was strange I was shut away on my own restoring pianos. They'd just arrived in Britain. They didn't really know why. God had told them to sell everything and they'd just come from South Africa. They just had some sort of feeling about reaching young people in Britain. They'd attached themselves as youth evangelists to a lively church in Bromley. They didn't know what I'd been carrying for 4 years. Neither they, nor I knew of their future...so I ofcourse never felt it relevant to share my past 4 years. The weirdest meeting in history. We just all gawped at one another....and anyway they were supposedly buying a piano! And the couple.... they are Rory and Wendy Alec of God TV. And the rest is in Wendy's book. Notice God never commissioned English saints for this task. He knows better! Notice , apart from Jackie Pullinger....God never commissioned an Englishman to pioneer a great church in Hong Kong. He's using Rob Rufus. God knows better! They're all South African! This a shame England! How long have you had the gospel? Only 2000 years! What kind of Christianity do you specialise in? First-level or sub zero level Christianity! At least the States specialises in 1st and 2nd level Christianity! And you can see why God used Rory and Wendy and not the great Chris Welch video library! He has a world to win! It's a close call...eh! But laughing aside, while I don't trust my petty-minded British small faith vision....I do trust the mighty Spirit within me to keep me connected to the Melchizedek order! Think about it! I was in exile. I was not in a church during this period. Apart from tuning customers who did I see?A few close friends who had softened to me. And God brought Rory and Wendy...before even they knew what they were doing in England to MY little house...to show me what I'd been connecting to in the Spirit! There's only 70 million others who could have responded to that grandpiano ad! And the whole piano thing turned out bogus anyway!!! I mean, saints...come on!!! This stuff's real isn't it? Keep sharing it. If for no other reason, than the fact that putting it all into words lets US (the writer!) know what we think...God uses it to remind us of all He has done and said. I find many little (and not so little) nuggets of blessing and wisdom in the things you share. it is also a process of literally counting our blessings or whatever the psamists said. Hey Chris - if you have time, check out my blog! :-))))) I am bursting with some joyful news! It's clear to some of us that God has placed in you, Himself with the desire to see His Body grown to full maturity operating at full capacity in the earth. Thy Kingdom come! He will complete through you, His vessel, the work He has begun. It is now your birthday 2014 and He is all the closer to bringing the desire He put in your heart to pass! Amen!! To others this vision looks like Darkness. But it IS the LIGHT that shines in our heart....just kind of looks weird once it is wheeled out of a meeting environment. They didn't get Jesus saying "Now is this fulfilled in your hearing." either. All He'd done was just read a customary portion of scripture. He didn't even do anything miraculous that day.And that is the point.